The vaulted tomb tradition continued in the Old Palace Period. Some scholars believe that the vaulted tomb in Kamilari, near Festos, was built as early as this period. Parallel to the large vaulted tombs, however, smaller private tombs were built. In addition, private tombs in the form of ceramic sarcophagi, and burial in ceramic jars (pithos) appear. The burials in small caves or holes in rocks also continue during this period. 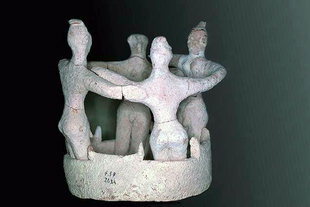 The Minoans buried people with their cherished possessions, such as jewellery, or personal objects like seals.